Our Mission is to make you happier at work! Our Philosophy is to help you foster a spirit of positive recognition for all types of good behavior, as an ongoing “program” within your company. In turn, we will help drive this positive spirit into your shared values, attitudes, standards and beliefs. We want to improve your corporate culture, and make your workplace happier! 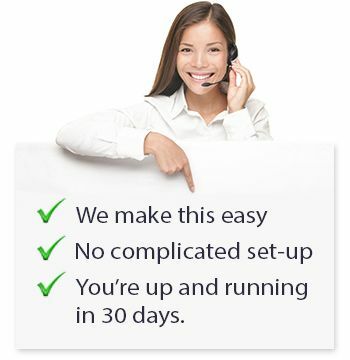 We will set up your “program” and help you run it. We will do everything that we can to make your program a success. Your corporate culture will improve, and you will be happier! Because You and Your Team – deserve an Employee Rewards Program! When you implement a WELL MANAGED and SYSTEMATIC Employee Rewards Program, you will train your managers to recognize and reward good deeds being done by their employees. 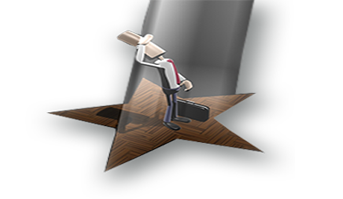 This will quickly start to improve your company’s culture, because people crave recognition. In fact, employees want recognition for good deeds and accomplishments more than they want a raise! We give you a complete turn-key Employee Rewards Program, with instructions on what to reward, how to reward, how often to reward, and how to get your managers to follow through month after month. You will see a minimum 3x positive result for every dollar your company spends on our program – that’s HUGE! We use GREAT quality logo merchandise, custom branded for your Company, so you can reward your employees and also, proudly, increase your Company’s branding identity. Each Reward arrives neatly packed in a white “Thank You” box, with colored paper inside, for each individual recipient. Every item opens like a gift, so you get significantly more value than the actual cost. Your Company merchandise lasts far longer than a gift certificate or a small cash bonus. It’s the reward that keeps on giving, ever time it’s used or worn. When you give an employee a Reward, they get to pick which of the selections they want to receive. Since it’s their personal choice, their satisfaction is greatly increased. And here’s the best part: a $30 cash reward can never equal the value you’ll receive from recognizing someone with a SILVER Reward, which arrives directly to them, delivered like a gift. you get to pick 6 - 10 great items for your program. 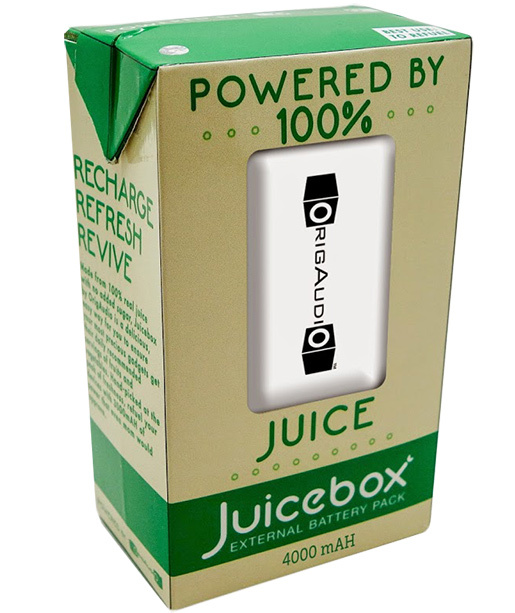 A power bank charger with both power and style, we call it “The Juicebox.” This is a 4000 mAh premium rechargeable lithium ion battery, which will fully charge your smart phone 2-3 times in between being recharged itself, and has capacity indicator lights to show its remaining charge. Its compact size fits easily in a pocket or purse, so you can take it anywhere. Like all our batteries, it come with built-in surge protection, it’s CE and Rohs Certified, and comes in a heavy duty plastic casing to dissipate heat quickly and prevent overheating. Best of all, your company’s logo lights up in an LED print area that’s 1.97” x 1.18” in size. Overall Size: 1.7″L x 3.5″W x 0.9″D, and 4.2 oz. weight. 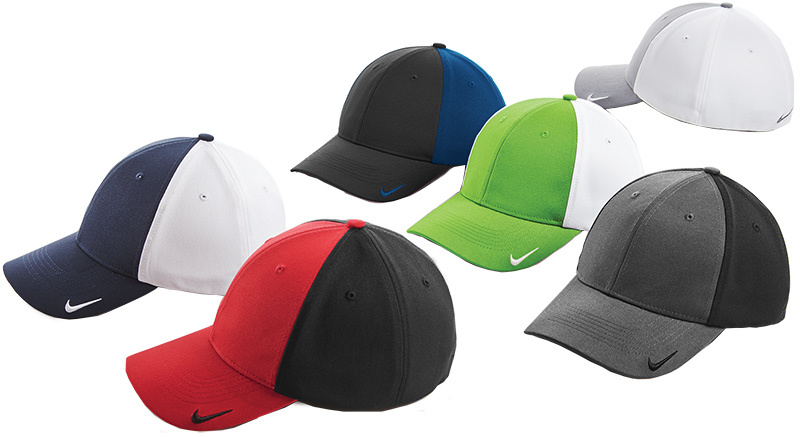 A fantastic fitted hat with a structured mid-profile design, by one of the most recognized and appreciated apparel brands in the world, Nike always makes a statement. You get maximum comfort and breathability with Nike’s “Dri-Fit” moisture management technology and built-in sweatband. Contrast color panels complement each other, as does a contrast Swoosh Nike trademark embroidered on the bill and center back, and fitted expandable stretch closure. Your company’s logo is embroidered front and center. The GOLD Reward: Together we create a selection of 6 to 8 very impressive merchandise rewards in the $60 value range. The GOLD Reward makes a strong positive impact every time an employee is recognized at this level. Using our example of 100 employees (shown below), your Company is recognizing the hard work of 2 people every week – at the GOLD Level. Don’t forget – the recipient gets to pick which of the GOLD selections he or she wants most! If you want the absolute best in portable power bank chargers, this is it. 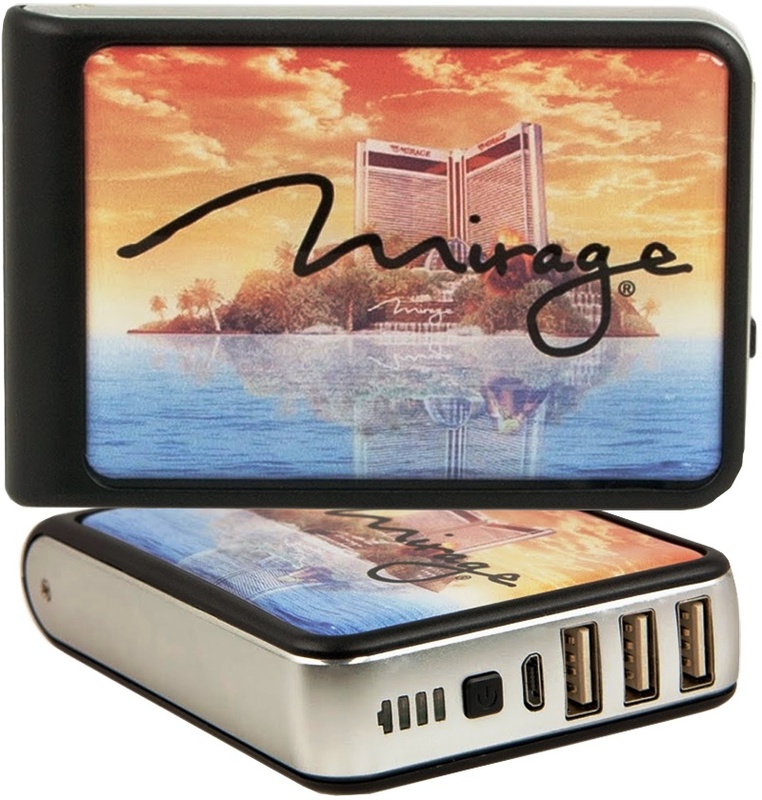 We use a massively large premium grade lithium ion battery, with 10,400 mAh capacity, delivering 3.1 Amps charging power to recharge your devices much faster than a wall outlet. It has 3 USB outlets and can fully charge 3 devices at a time, with enough overall power to charge 6 cell phones, or 3 iPads before running out of power. We also give you built-in surge protection, and a heavy duty plastic case that dissipates heat quickly and prevents overheating. Capacity indicator lights show the remaining charge, and it’s FCC, CE and Rohs Certified. There’s a big print area for your company’s logo, 3.5” x 2.5” with full color digital printing. Overall size is still small enough to travel easily: 2.8″L x 4.2″W x 0.9″D, and 8.8 oz. weight. Our ceramic drivers insure that you’re getting amazing stereo sound, with full range bass enhancement, plus a super-strong built-in rechargeable battery that lasts 10+ hours of continuous play. We also give you both NFC (Near Field Communication) and a 33ft. Bluetooth wireless range, so you can “pair” most devices with just a tap, and control your speaker from across the room. We’ve added a built in microphone with fantastic call quality, for making hands-free conference calls, and “call-choice” to easily toggle between your phone calls and stereo music. 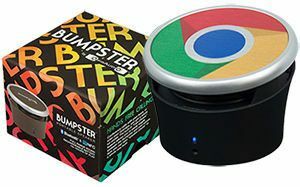 Each speaker is custom printed with your Company’s Logo in a large 3” diameter circle, with full color digital printing directly on the aluminum top. 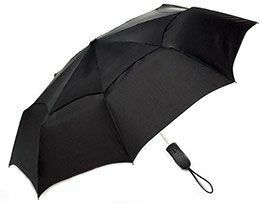 Overall Size: 3.1″L x 3.1″W x 2.5″H, and 7.4 oz. weight. • Compatible with any device that has Bluetooth or NFC wireless connectivity. Also included is an audio cord for devices that don’t have Bluetooth/NFC. 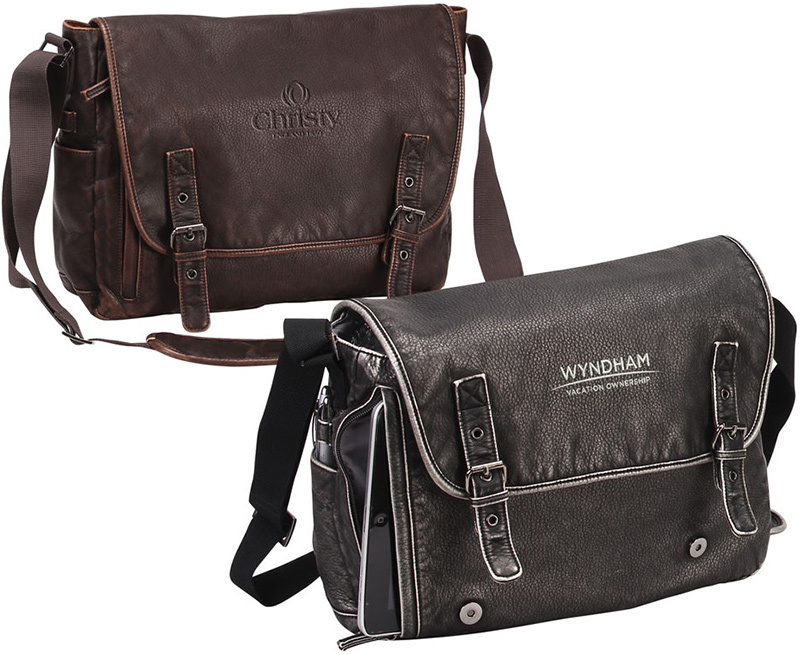 A great looking bag that’s equally perfect around town or traveling the back roads, and carried in style by both men and women. Done in high quality distressed faux leather so it has a rugged and timeless vintage look. The front flap is secured by dual magnetic snap closures. Underneath the flap there is a vertical zip pocket for your tablet. 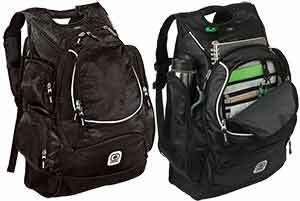 The main compartment has a zip pocket, pen loops, and open pockets for keys, phone and other accessories. The side gusset has an open pocket and additional pen loop for quick access. 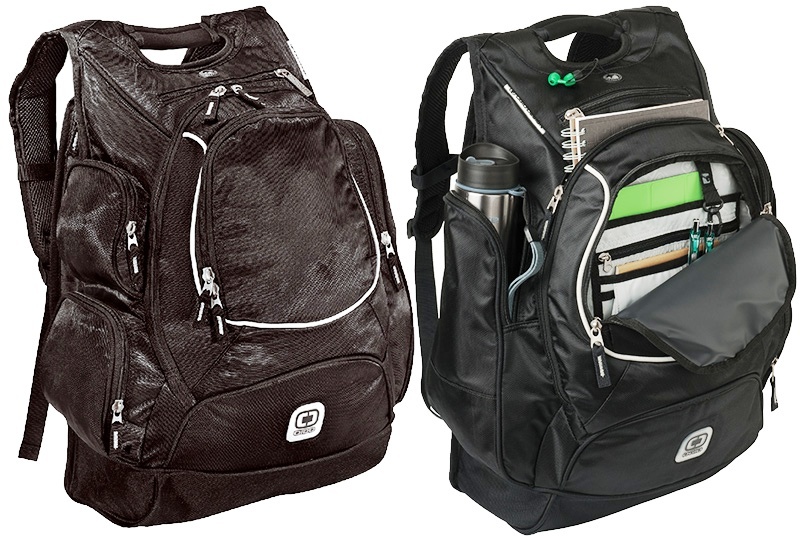 The back of the bag has a large open pocket that’s also secured by a magnetic snap. 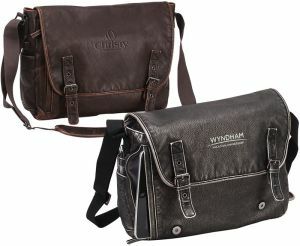 It’s finished with a padded adjustable shoulder strap for comfortable carrying. Comes in Metro Black or Indiana Brown. Overall size: 15”W x 11”H x 4”D. Your company’s logo is debossed for a subtle tonal look or embroidered for more visibility, size 4”W x 3”H. The PLATINUM Reward: This is your marquee selection of 5 to 6 “statement rewards” in the $110 value range. The Platinum Reward makes a lasting impact on the person who receives it – and also on co-workers! you get to pick 4 - 8 great items for your program. 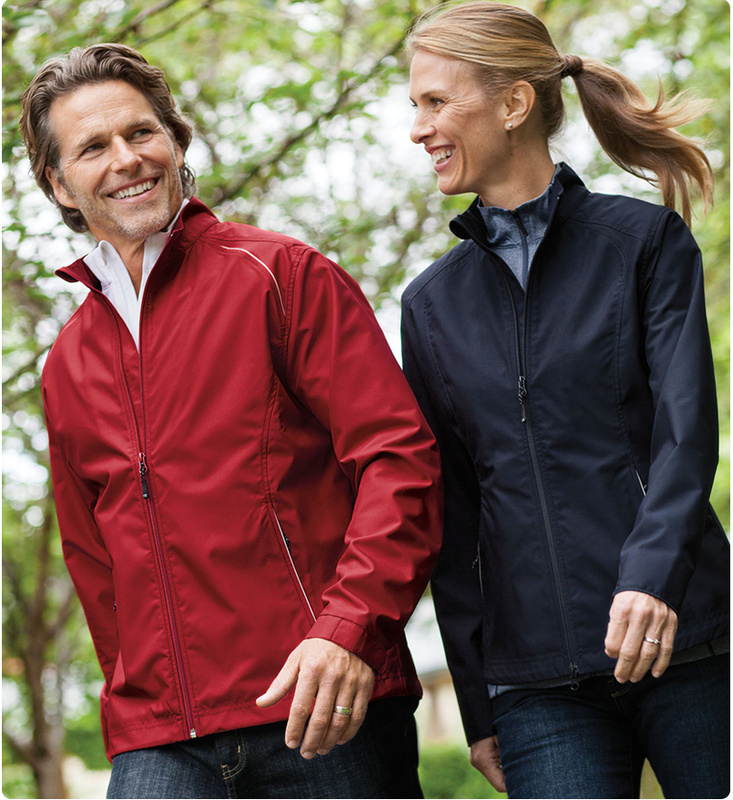 This is the best selling jacket, from the best selling name brand in corporate apparel. The C&B Beacon lets you take on the elements in style, with this lightweight wind and water resistant 100% Poly twill jacket. Featuring reflective trim that increases your visibility in rough weather, and also compliments the modern look. Full length zippered front, fully lined inside for comfort, stylish stand-up collar, stretch storm cuffs, zippered pockets, and an adjustable drawcord at bottom hem, all features that complement each other for both weather resistance and good looks. Plus it’s machine-washable and comes in 7 colors. Your company’s logo will look great embroidered on the left chest, and it won’t affect the weather resistance. 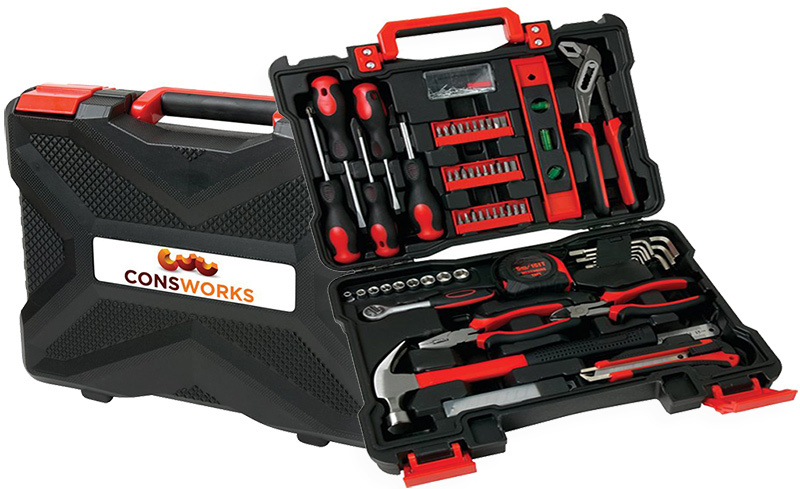 This 73 piece tool kit gives you everything you need for all types of projects in the garage or out on the road. All tools are specially held in place and organized inside a durable molded plastic case with carry handle and double snap closures. We’ve included a 9 pc driver socket set, driver handle, 30 pc bit set, ratchet handle, measuring tape, 4 piece screwdriver set including 2 philips and 2 flat heads, diagonal pliers, adjustable pliers, 9 pc allen key set, claw hammer, utility knife with 10 replaceable blades, level, fastener set w/case and a ruler. Overall Size: 11.5″D x 15″W x 3.375″H. Your company has a custom print area for your logo of 1.25”H x 7.125”W. Imagine coming to work tomorrow, finding your coworkers were more happy and fulfilled… Imagine if your managers were helping foster a culture of recognizing and rewarding good deeds and accomplishments from their staff. What if this type of recognition happened every week, and you had an established “positive rewards process” to insure that it kept happening month after month? What does your company look like six months from now, when you’ve created a more positive culture, and increased your employee engagement? How fun and rewarding could this be? It’s just around the corner… we do this for people just like you! For the best positive impact on your team, we strongly recommend a minimum budget of $175 per year, per employee, for your Employee Rewards Program. But our program is flexible, you can spend more or less, just tell us how much you want to spend and we build you the best Rewards Program within your budget. Give out Recognition Rewards EVERY WEEK. You need consistency and reliability, to keep the energy going, and make this part of your culture. You don’t need to give out Rewards evenly, you want your best people to be recognized most frequently. But every employee should be recognized at some level, at least once each year, to maintain the momentum and comradery gained by this program. If you have 100 employees, your Company should be recognizing at least 6 to 7 employees each week, across all 3 Reward Levels. Because People Crave Positive Recognition! 1The number-one reason most Americans leave their jobs is that they don’t feel appreciated. In fact, 65% of people surveyed said they got no recognition for good work last year. 260% of Best-in-Class organizations stated that employee recognition is extremely valuable in driving individual performance. 3Companies with strategic recognition reported a mean employee turnover rate that is 23.4% lower than retention at companies without any recognition program. 446% of senior managers view recognition programs as an investment rather than an expense. 6Only 14% of organizations provide managers with the necessary tools for rewards and recognition. 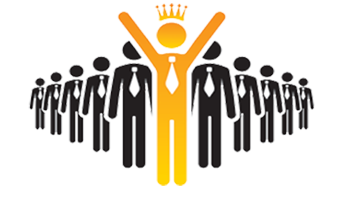 Do You Want An Awesome Employee Rewards Program for your Company? Please Have An Expert Contact Me! This Isn’t For Us, We Don’t Like Being Happy.